A desk calendar. On the left, Mon Sept 10 2001. On the right, Tues Sept 11 2001, the paper charred. It is a powerful illustration of an act that forever changed the chronology of our country into before and after 9/11. 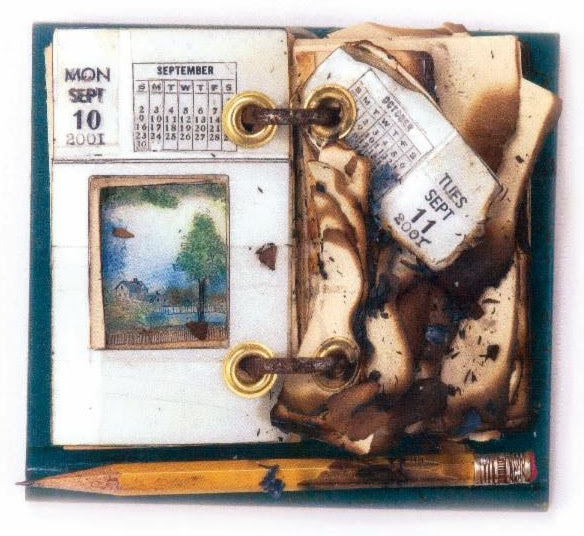 It is the work of Susan Tibbles, an assemblage artist and illustrator. FOTM Master Artist Bob Privitt describes her art: She has the unique ability to take unassuming objects, merge them with a concept and present a thought-provoking artwork that combines both symbolic and intellectual results as well as an aesthetic experience. Susan, self-taught, began her career in 1990 and has exhibited in the U.S. and in Europe. Los Angeles Times “Opinion” art director Wesley Bausmith, impressed with her work, asked her to create an image that would illuminate the Bush/Gore Presidential race. Thus began an ongoing relationship with the L.A. Times and other leading newspapers, a relationship that perfectly combines pungent wit and visual poetry. The 3-dimensional original artworks created for the L.A. Times have been widely exhibited and form a unique record of millennial political thought. Distinguished critic Peter Frank says of her work: She is not a political cartoonist, she is a political satirist, an equal-opportunity lampooner whose jibes land on all sides of any issue. The assemblages have to stand on their own as works of art that communicate graphically, thematically, and even metaphorically. Tibble’s documentation was sponsored by John Brant Wealth Advisors, John and Cherie Brant. The AfterGlow was hosted by Jim and Mary Galbraith.